Day One: Toledo. After flying a 9.5 hour red-eye flight, we arrived in Madrid, rented a car, and drove straight to Toledo, about 2 hours away. This was a great first impression of Spain. It was literally a city set on a hill, if you will. 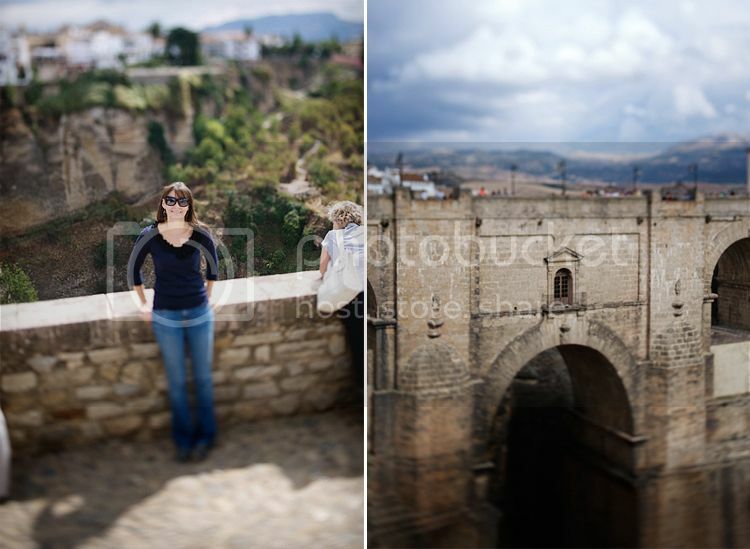 We drove up to Toledo and walked from the bottom of the hill to the top, exploring as we went. It was so cool to see all of the outdoor cafes, city courtyards, shops, and beautiful buildings. This was a huge city once you got inside- and like most Spanish cities we saw, a very easy place to get lost. If you look closely at the first picture, this is taken from the bottom of the hill and its looking up at the main government building in Toledo...it looks so far away, right? I thought so too. But, you could walk there in what seemed like minutes. We loved it here, almost as much as the Alhambra. Such a gorgeous and amazing city. 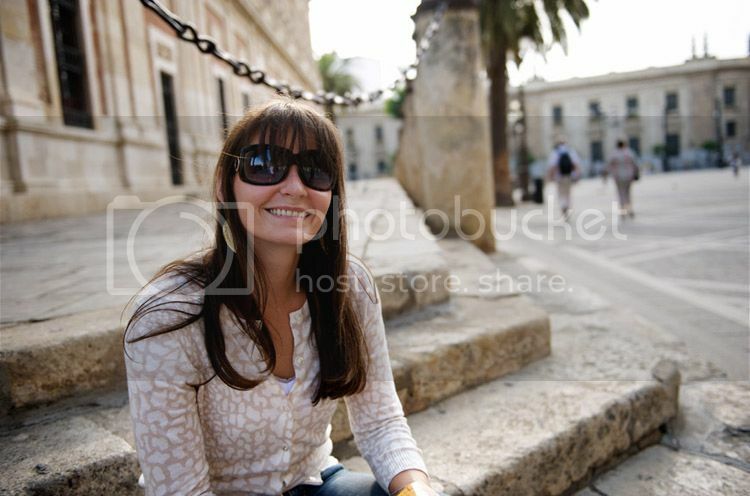 Day Two- Granada. Definitely my favorite part of the entire trip. Here's how the day started...we drove in late the night before to Granada and stayed at the Hotel Saray in the business district. 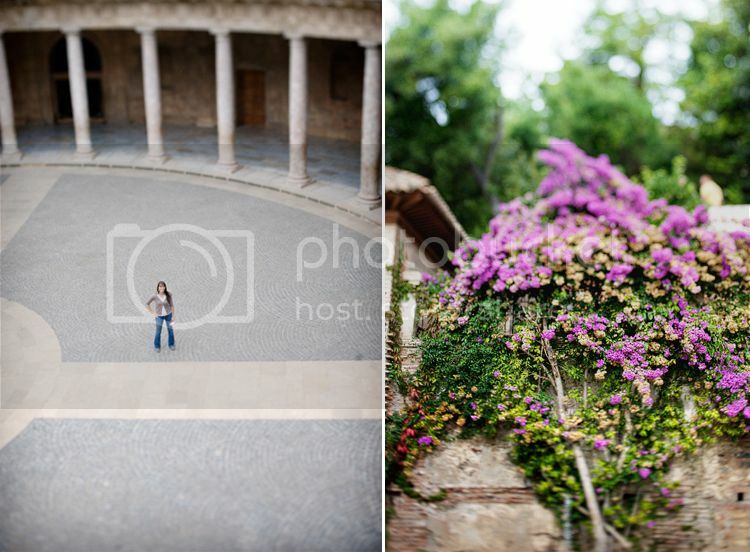 We got up early in the morning, went to church, and then set out to find the Alhambra. We walked right up and bought tickets for a tour that started two hours later. Later we learned that people wait months to get tickets so we felt really lucky to have been able to get in that day. The Alhambra and Generalife gardens made the long flight and endless driving all over Spain entirely worth it. You cannot grasp how beautiful (and massive) this place is with words, or even pictures for that matter. Even spending the entire day walking the grounds, you can barely take it all in. 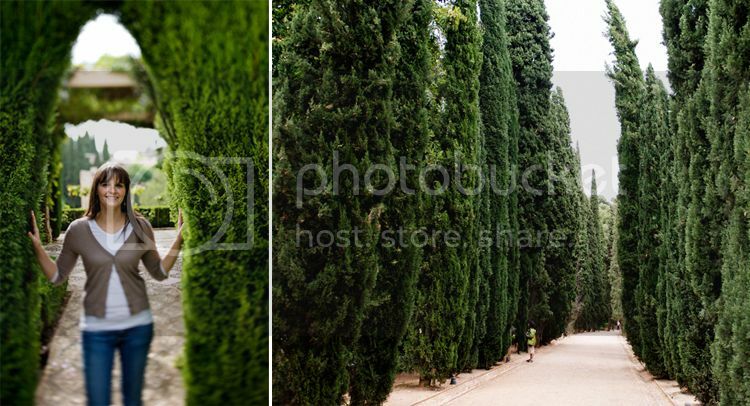 The landscaping, history, buildings, and sights were nothing short of breathtaking. I literally could have stared at the view (from St. Nicolas) all day long. Amazing. 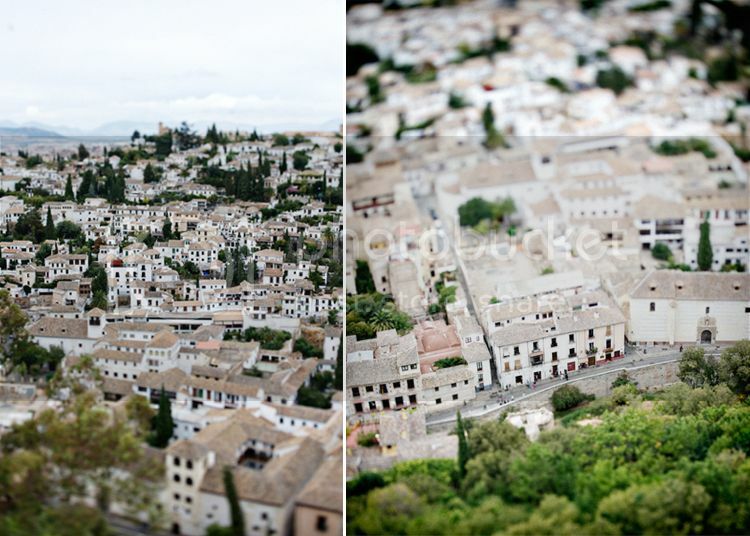 Some of the pictures are looking down from the Alhambra into the old city Granada, which is so charming and beautiful. After leaving, we drove to the St. Nicolas viewpoint in the Albayzin to watch the sunset over the Alhambra. Gorgeous. While the Albayzin is considered a more dangerous part of the city, I found it totally gorgeous and very quaint. If you ever have the opportunity to visit Spain, do not miss this. Day Three- Ronda, the White Hill Town. We drove from Granada to Marbella, where our hotel for the week was located. The next morning we decided that we would drive two and a half hours through the mountains to Ronda. Most Spanish cities are made up of very old whitewashed homes so as you approach a mountain city, it's white homes are a beautiful contrast to the lush green mountains surrounding them (hence, White Hill Towns). 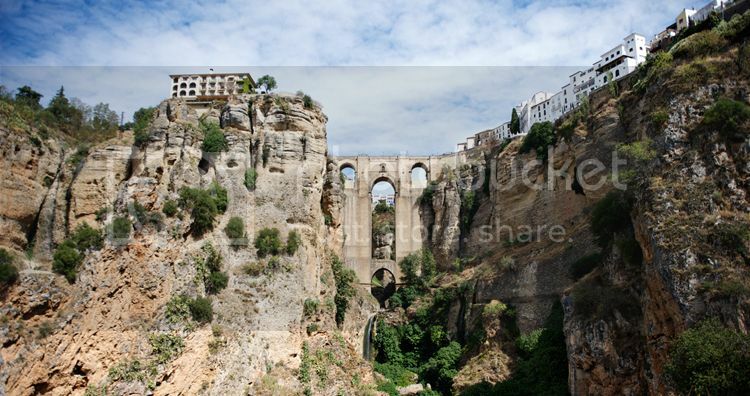 Ronda was incredible- the New Bridge separates old Ronda from new Ronda. 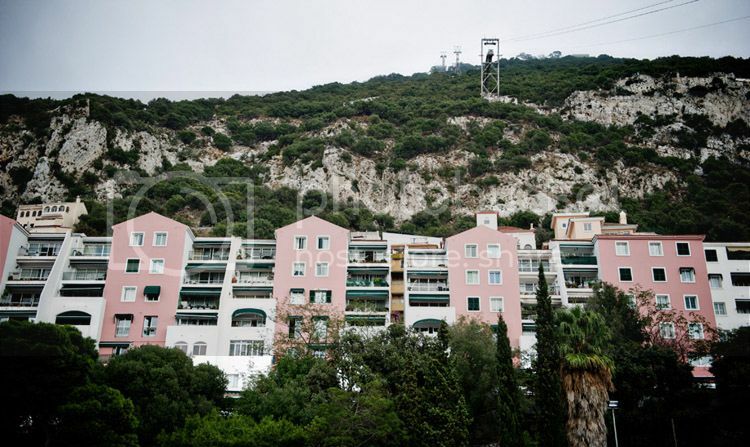 Homes, shops, and restaurants are perched along the cliff that separates these two parts of the city, now connected by the famous bridge. Brian and I walked the long hike down the cliff to get a great view and pictures of the bridge. We walked all over the city, ate gelato at an outdoor cafe overlooking the cobblestone city streets, saw the oldest bullring in Spain, and ate lunch at another outdoor cafe in the city center. We loved this charming city- everything about it was what you imagine about Spain...beautiful white homes with fancy wooden doors and beautiful inner courtyards, outdoor cafes, Spanish shops, a rich history, and old city charm. Ronda was time well-spent. Day Four: Gibraltar. 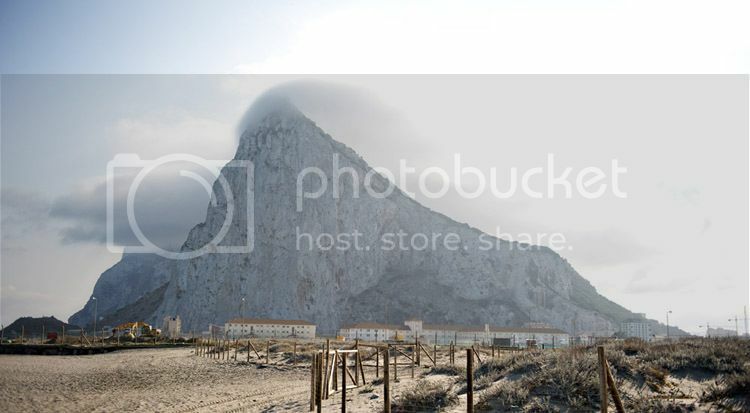 Not only is Gibraltar a rock, but its also a city on the Spanish coast that belongs to Britain. After spending three days in Spain, it was interesting to drive into Gibraltar and literally feel like you were in England- the architecture, streets, language, money, people, and even the weather were all very British. It was such a downer that the weather was overcast because you need to go to the top of the rock when you can see all around you. You cannot imagine how huge this rock is- its bigger than any picture can make it appear. We walked through the public gardens at the bottom of the rock and through the city, where we ate a traditional, and quite unpleasant, English lunch while we were waiting and hoping for the weather to clear up. No such luck. So, we decided to just ride the lift up anyway and check this site off our list. It was worth it. You could literally feel high how up you were- and it almost made it more creepy that you didn't know where the edge was and how far down you were looking. The Rock is as famous for its monkeys as it is for its height. The monkeys are believed to have been transported over from Morocco, a short ferry ride from Gibraltar. While they may appear docile at first, if they spy any food or even a plastic bag, they will jump on you and get it. We saw many tourists with monkeys on their backs. Brian even had a small plastic bag all crumpled up into a teeny pocket on his bag and a monkey saw it and grabbed it right out from under him. Crazy. After seeing the Rock, we drove over to the beach and I sat on the sand while Brian took more pictures. Day Five: Malaga and Antequera. 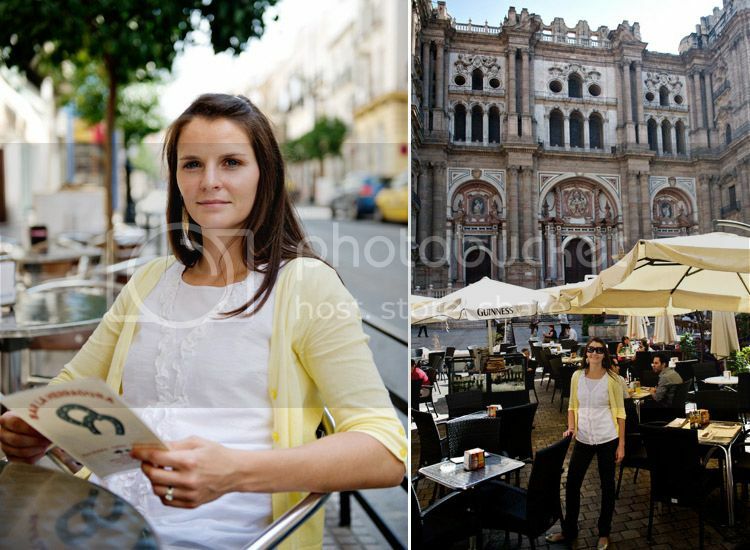 While Malaga may not be on most must-see lists, it was one of my favorite cities that we walked through. Every building was a different color- and I'm not talking shades of brown. Blue, Yellow, Red, Orange- every color of the rainbow. 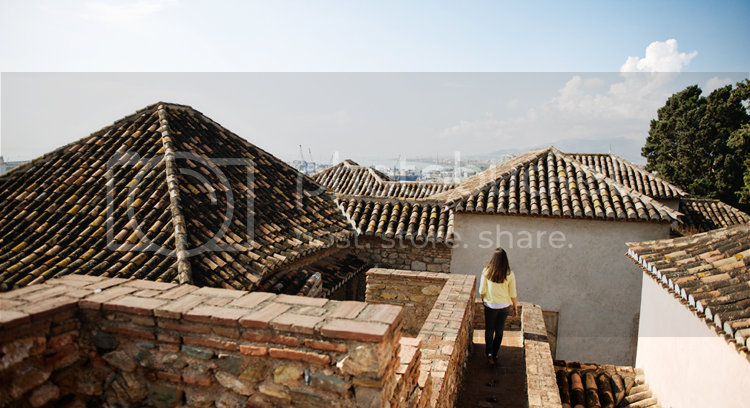 We walked through Malaga's Alcazaba and then past the city's cathedral and into the city square right off of the church. Sitting at an outdoor cafe and taking this in was my favorite part of the day- we were surrounded by buildings on every side- all of them were so old and colorful and amazing. 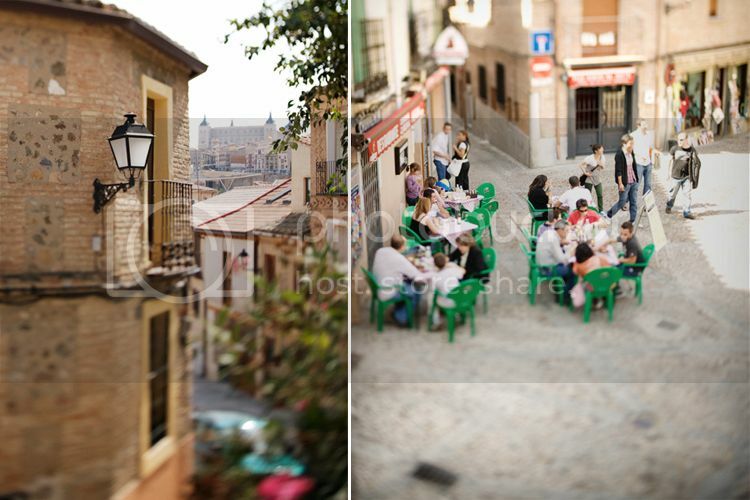 Walking through the cities in Spain is unlike anything else I've ever done. 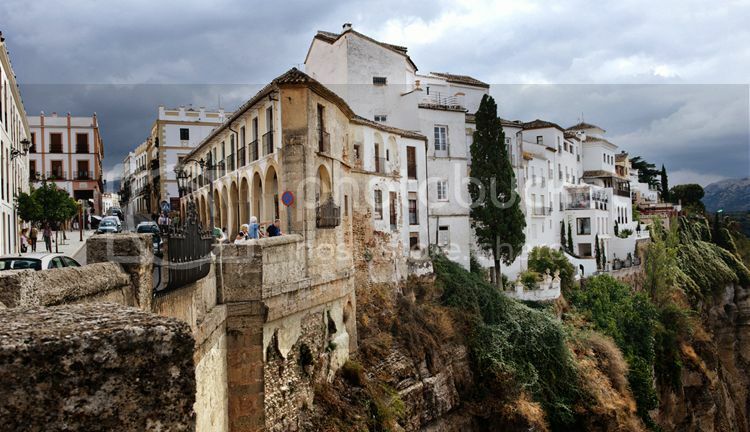 We then drove to the town of Antequera. What is interesting about Spain is not only does every city seem like its been there forever, but every little city is like a big city. No one commutes- you live where you work. Antequera was the perfect example of this. It appeared to be a small town on the map, but once you got inside, it was a big and sprawling city. We had our first experience with tapas here. First off, I have to say that the food in Spain was a major disappointment, in my opinion. Everything seemed to be preserved in vinegar, it was hard to find fresh fruits and vegetables at the restaurants, and the flavors and spices were not making my palate happy. Our tapas that day was the prime example. You see pig legs hanging from almost every grocery store and restaurant in Spain- skin, hair and hoof still attached. So, when you eat tapas, you eat ham and that ham comes straight from those vinegar-preserved pig legs. The smell and the taste were far less than satisfying. To make matters worse, Brian and I were walking all day long most days so when we would sit down to eat, we were starving. What a letdown! We stuck to the Italian restaurants as much as possible. Day Six: Sevilla. Sevilla has a romantic history as the capitol and center of Spanish history, but as the Guadalquivir river dried up, so did the city's usefulness. Much of its size and history remain, but its lost its rich reputation. We did not hear great things about Sevilla up to this point of our trip. Most Spanish cities are immaculate- well-kept and extremely clean. Sevilla was the exception. Despite what we heard, both Brian and I really enjoyed our time here. 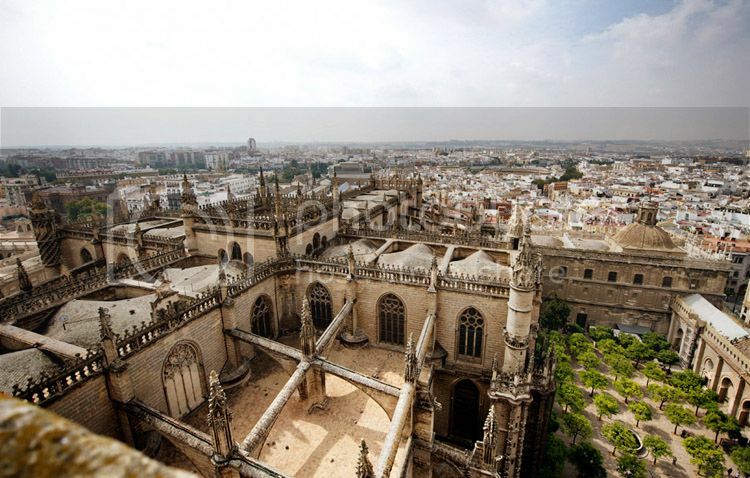 There is so much to do in Sevilla. We toured the cathedral, the largest in Spain, and the Alcazar, the Moorish palace that still stands next to the famous church. We also saw the gorgeous Plaza de Espana and tried in vain to find the Flamenco Museum, which was so buried in the middle of a maze-like residential district that even locals didn't know where it was. But, I was glad we got lost here because we were able to get a really great taste of real life in Sevilla and the huge cultural role that flamenco plays. We walked by dress shops that had the most ornate and gorgeous flamenco dresses I've ever seen. As the sun set, we walked to Sevilla's bull ring for a tour. It was very interesting to see the inside of the ring and to learn a little more about the sport. I would have loved to have seen an actual bullfight, but they are only on Sundays this time of year, which we learned too late. We walked all over the city of Sevilla, until our feet hurt, probably logging at least 10 miles on our poor little hooves. Time for a day of rest! Day Seven: Hotel R&R and Peurto Banus in Marbella. 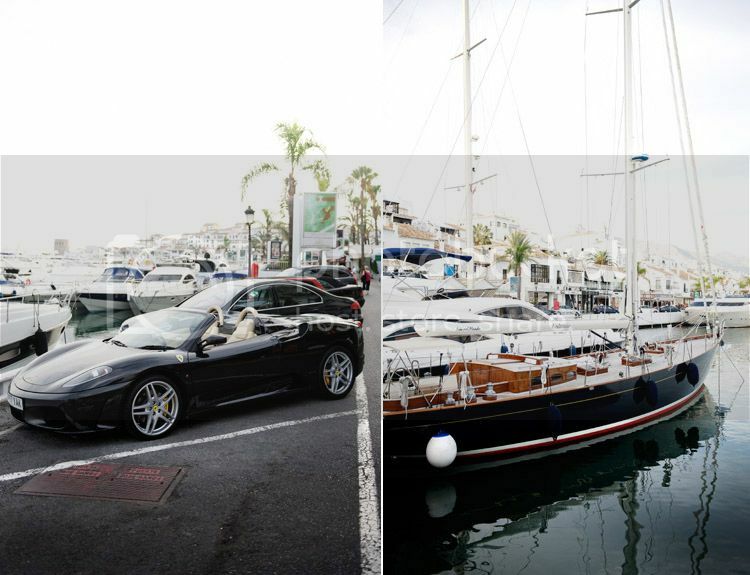 We spent most of the day getting some much-needed R&R at our hotel and then went out at night to see the famous port here in Marbella. This port is in no tourist book and so most don't even know it exists. After walking along the port and eating dinner overlooking the Mediterranean Sea, I must say that if you don't experience Banus, you are missing out! This is a stop for the filthy rich, and it shows. Every major designer that you've ever heard of had a store right here on the port. These stores were flanked by countless gourmet restaurants and gelato shops. These establishments must serve the owners of the incredible multi-million dollar yachts that were lucky enough to get a parking spot here. Wow- we saw some crazy boatage, and a little dingy too (as pictured). We ate at a delicious Italian restaurant that was literally sitting on the sea. We watched the sunset over the Mediterranean while we drank our $10 Diet Coke and ate our favorite meal of the trip. Perfect. Our rental car, a little Fiat, broke down on the way home from Sevilla. 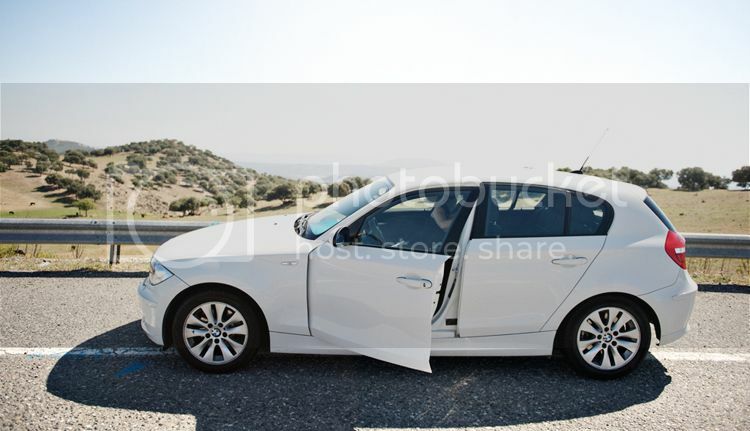 We traded it out in Marbella for this...Yes, thats a BMW. Upgrade! Proof that Brian did actually come on the trip with me...don't you love the guy in the background...wonder what he's thinking? Day 8-9: Cordoba & Madrid. On our way back to Madrid, we stopped in the city of Cordoba, famous for the Mezquita. We only spent a couple of hours here, but we were able to see this amazing mosque/cathedral. The architecture was incredibly interesting inside, given that it started out as one of the biggest Islamic mosques of its time (circa 8th century) and is now sporting a huge Catholic cathedral literally in the middle of the mosque. The Catholics decided that the mosque was too beautiful to destroy, so they just built right in the middle of it. The top pictures are of the cathedral, obviously. We also stopped on the outside of the Alcazaba (Moorish palace) here and I thought it was so authentic...because of the red sand and palm trees all around it, as you looked at it, you could almost imagine the African Islams still living and walking around there. After Cordoba, we drove the remaining 4 hours to Madrid and checked into the Hotel Intur Palacio San Martin right in old Madrid. We quickly got out to explore the beautiful city. We walked through the incredible and old Plaza Mayor, a local fish/farmer's market (more pig legs! 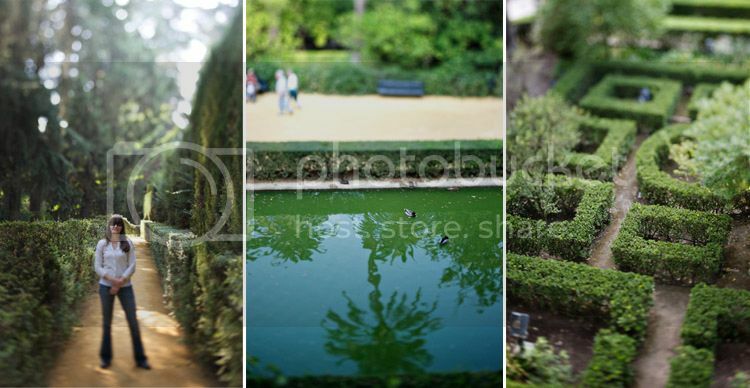 ), through the city streets, and eventually over to the Prado to see some of the most famous paintings ever completed. 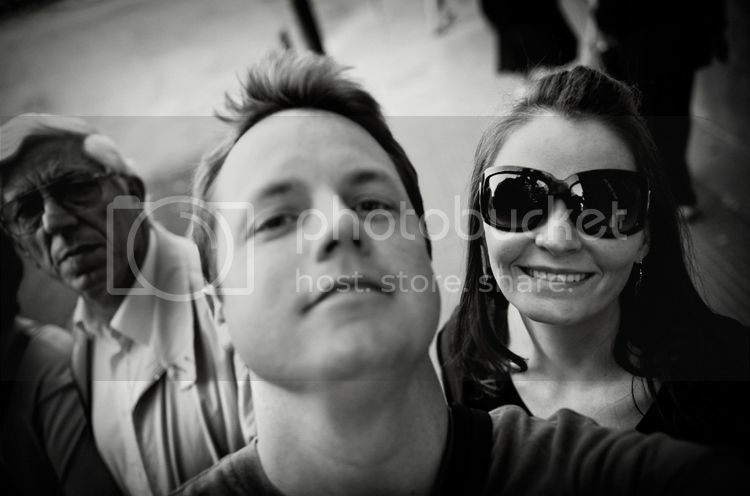 Since neither Brian nor I are huge museum people, we quickly went through this. 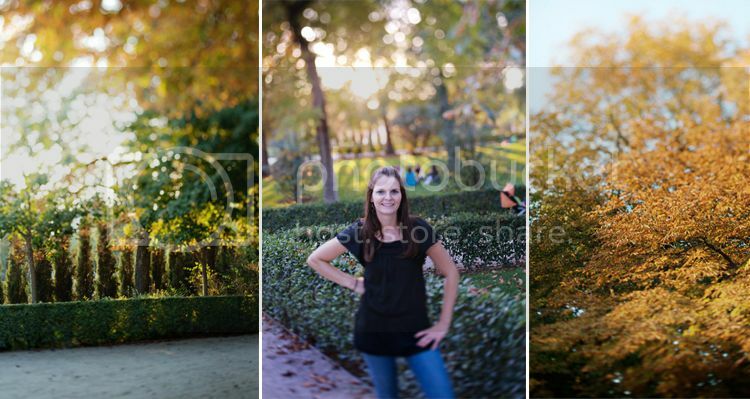 Then, we walked across the street to Parque del Retiro- this was amazing. Because it was a Sunday, everyone in the city was out. There was a lake with rowers, street performers, vendors, and tons of families out. We spent a good hour here, waiting for the sun to set. After leaving, we went back to the Plaza Mayor to eat our last Spanish dinner. The next morning we flew home! I loved Spain, but I really missed my kids and could barely stand the 11 hour flight (plus two additional hours on the tarmac) to get home to see them. It was all I could do not to run to them after we landed in Dallas. I only had three casualties on the whole trip- my Sonicare toothbrush, my CHI, and my bangs (they were fried crispy on day one from my CHI). And, yes, I did have a converter. Word to the wise: Do not bring anything electrical on a European trip that you're not willing to lose.